RICHARDSONS RUMBLE COME AND TRY SPORTIVE. This event is the season opener for many riders and gives everyone the opportunity to get that magic 100 in without the pressure of a Classic Sportive. 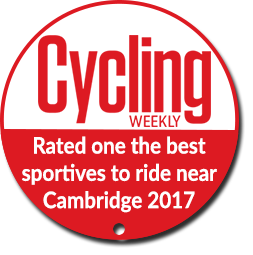 The route winds in way around four counties starting and finishing in St Ives, Cambridgeshire, on quiet roads without the mammoth climbs of other events. However don’t be fooled as the distance and sometimes the wind will offer a good challenge for the 100milers. If you just easing into the season the 67 mile medium ride with be a good enough test for fresh legs. On your return to the finish you will receive a food token for the “Local Cafe” opposite the finish for your beans on toast and a hot drink. Registration will again be at the new St Ivo Centre on Westwood Road PE27 6WU where there is ample car parking and changing facilities. The Zest café will be open for tea and coffee plus light snacks from 07.00am, for you to purchase. There is an overflow car park in East Street less than ½ mile from registration and 200m from the start this is free on Sundays. Registration will open at 7.15am and close at 09.30am to sign on and collect your numbers, the first riders can start at 08.00am on the long ride and 08.30am for the medium ride, short route starts at 09.30am. The route will be fully arrowed using the well tried Wheels in Wheels system with confirmations within 200m of each turn and every mile along the whole route. If you don’t see a sign don’t turn. Extra warning signs will be displayed where necessary and we will ask riders to adjust their riding to the conditions. See samples on display. A basic map is available on request for each route. Please note the emphasis is on the rider to stay on the route, emergency telephone numbers for the day will be available at registration and the start so please make a note of these for your own safety. For the less experienced riders and newcomers we will have ride chaperones with you who will take groups to help pass on information on riding in groups, sportives and nutrition during the ride. These will ride at a speed suitable for each group and will keep everyone together to help pass on their experience. These will only be available for the short ride only and riders wanting to sign up for a group must do this in advance. The service is free and anyone on the short ride can join these groups. We will have our team of mechanics at the Richardson’s shop to check machines and of course Richardson’s Service van out on the route to help repair more than the basic punctures. Each feed will also have a supply of spares. Please read our terms and conditions concerning cycles. We will also be operating a “broom wagon” to pick up terminal mechanicals and riders.